James Tager had several advantages walking into his interview for superintendent after lunch this afternoon, the last of the day for the Flagler County School Board. He had just visited a couple of schools in the district and could make direct references to what he’d seen, as his two competitors this morning could not. 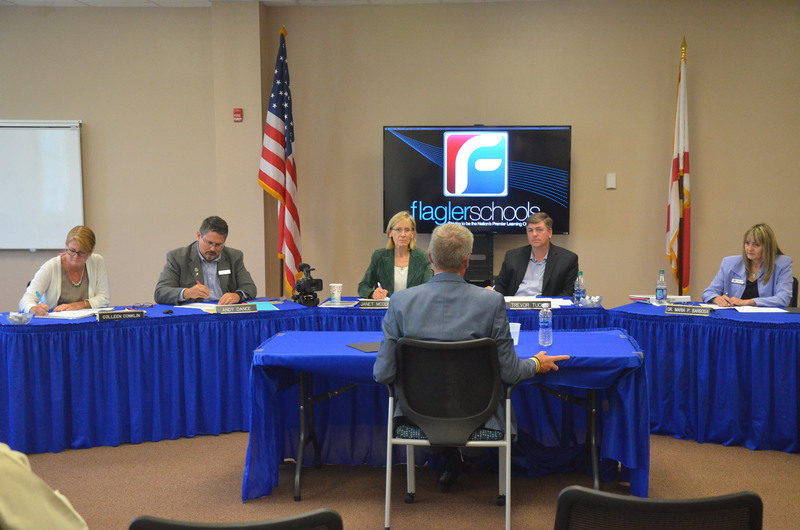 As a long-time administrator in Volusia County schools, he was conversant with Flagler not just as a neighboring school district, where he’s on a first-name basis with several officials, but as a community. He grew up in New Smyrna Beach, went to school at Flagler College, and lives in Port Orange, making Flagler familiar territory he’s crisscrossed over the years. He described how at Atlantic High School, where he’s the principal, a group of faculty, himself included, meet at the end of each quarter with every student who has one F or more. “It’s not a troublesome meeting for the student, it’s a ‘we’re here to help you’ meeting,” he said. Anything that can be done differently to improve graduation chances is attempted, from altering the schedule to providing a mentor, Tager included. The method’s monikers are a bit hokey (that meeting is called a “shark attack,” because the school’s mascot is a shark, a more intensified intervention sends students to “the bunker,” where the school pays teachers extra to provide further tutoring) but it’s worked, raising the school’s graduation rate for all categories of students. 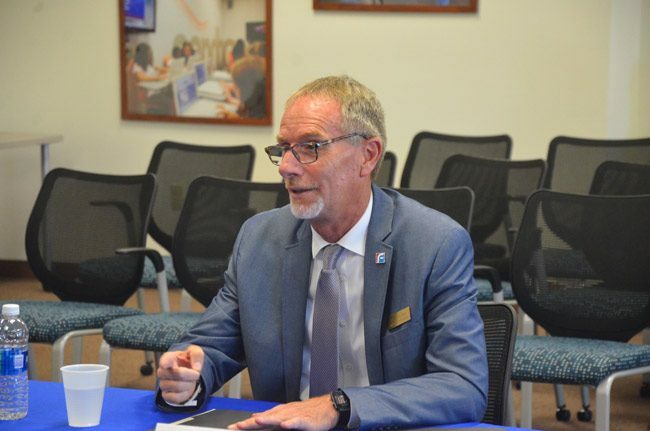 “It’s about students, it’s about their families, it’s about faculty and staff, and I think you change somebody’s life when they graduate,” Tager said, describing that achievement in some of the more evocative words interviewees used today: the human element was apparent behind Tager’s stats. Tager spoke from outlines he’d prepared and used the previous evening during a meet-and-greet with members of the community at Buddy Taylor Middle School. It included what he called his 100-day plan (a conceit once limited to particularly successful presidents but now coloring the gimmickry of new executives in many fields): He wants to focus on improving the “graduation rate for all subgroups,” increase Advanced Placement enrollment for all students (he did not mention the IB program), improve the district’s rather dismal standing, relative to other counties, in earning industry certifications for students in vocational fields, and examining the district’s special education approach. He was basing the plan on what he’d gleaned from the citizens’ survey the school board conducted during its search for candidates. Tager’s ideas about improving the graduation rate were clear. His ideas regarding the three other initiatives were less so. technology, engineering, science, aeronautics (he noted the similarities between some programs at Atlantic High and at Flagler Palm Coast High), aerospace, aquaculture, law and order. Tager, of course aced the question on how Florida budgets and what “FTEs” mean—the acronym that stands for “full-time equivalent” students, and that defines how much money a district gets from the state—and used the question to remind board members that he’s gone through cost-cutting years as an assistant superintendent. A question about how he defines the primary “customer” of the school district led him to place students first, but not to the exclusion of faculty, staff, residents and businesses. He then said he would hold forums at the middle and high schools as a new superintendent to better understand the district. “I’m not here to be Jacob’s cheerleader but he’s a hard guy to follow,” Tager said. But when asked how visible he’d be in the schools, he said he hopes to be in schools “at least one day a week.” That would be a significant departure from Oliva, who early on made a point of being a roving superintendent—one more likely to be in a school or in someone else’s office than at his desk in the district office. He has no such desk in his office, to make the point.